The Saronic archipelago comprises five stunning islands just off the coast of Athens, Greece. They have everything you need for a fantastic holiday; exquisite beaches, fascinating monuments and upmarket resorts. Aegina is the most popular, with a number of luxury family-friendly hotels. Poros is great for water sports, Hydra and Spetses boast wonderful ancient architecture and elegant mansions, whilst Agistri makes an ideal serene getaway. One of the most remarkable structures is the Temple of Aphaia on Aegina, which features tall, magnificent pillars on a pine-covered hill. Archaeologists claim it was built in 480BC to celebrate a local deity from pre-Hellenic times. 6km east of Aegina Town is Paleohora, the awe-inspiring remains of a hillside Byzantine village site, comprising over 30 church ruins. Hydra is a unique place, with no cars or bicycles allowed on the island. Be sure to visit the Kimisis Tis Theotokou Cathedral in the west, a stunningly decorated 17th Century cathedral close to the harbour. There is also a small museum displaying various religious artefacts and vestments. Stroll along Spetses’ northeast district of Dapia for great views of the Anargyros Mansion, which was owned by a benefactor in the early 20th Century. In the main town, you can ride a horse-drawn carriage through the gorgeous scenery, making the perfect romantic setting. The Saronic Islands are easily reachable by ferry from the Greek mainland, with frequent high-speed crossings provided every day. You can sail from Ermioni, Piraeus and Porto Heli to any of the islands, depending on your departure terminal. There are also fast and frequent crossings between the Saronic Islands themselves. 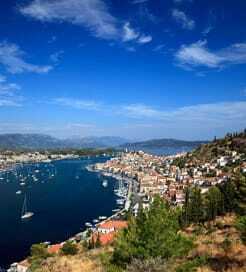 These routes are operated by Hellenic Seaways who offers award-winning ferry services. I was impressed with the facilities. Enjoyed the experience, will deffo do it again. The ship was smack on time for both crossings. The staff were helpful and efficient. The trip out to Alonissos was calm and uneventful, the trip back to Skiathos was however a real roller coaster. The seas were quite rough. I loved it, but sadly quite a few passengers were seasick. The crew were busy with sick bags and kindness for the poor sufferers. Good service, comfortable ship with good amenities. No issues. 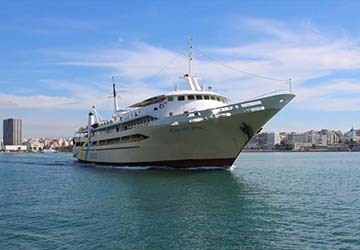 For more information, please visit our Ferries from Athens to Saronic Islands page.